I always thought of polenta as a “fancy” food that was hard to make. But when I started making polenta with sausage ragu, I realized it is nothing more than cornmeal porridge – the Italian form of grits, which I had grown up eating regularly. Since it is simple to make and a new family favorite, I set out to find more recipes using polenta. Honestly, many I found are just variations on a sauce over polenta. I wasn’t willing to bother with just a variation on a dish I already really liked. Then I stumbled on this little gem on pinterest. This dish is different from anything else I’ve ever eaten and is phenomenal. The salsa on top is good enough to eat on its own. But on top of the creamy polenta and chewy, charred peppers, it is even better. 1. Preheat broiler or grill. Toss tomatoes, jalapeño, and onion in olive oil. Broil or grill tomatoes, jalapeño, red onion, and poblanos for about 5-10 minutes on each side (starting with cut side down). Turn when beginning to char. Cook other side until charred as well. 2. In a food processor, chop tomatoes, jalapeño, onion, cinnamon, garlic, and salt to your desired salsa consistency. 3. Preheat oven to 400. In the bottom of a lightly greased 9×13 baking dish, spread a thin layer of the salsa. 4. In a medium saucepan, combine water, chicken broth, and cornmeal. Heat over medium heat, stirring constantly. Bring to a boil, then reduce heat and cook until thickened and pulling away from sides of the pan, stirring with whisk or wooden spoon. Remove from heat, and stir in corn, cream cheese, and ¼ cup of green onions. 5. 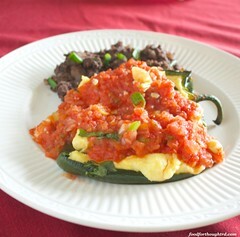 Spoon polenta into poblano pepper halves until each pepper is full. (You may have leftover polenta.) Place stuffed peppers in baking dish. Cover with remaining salsa. 6. Bake until heated through, about 5-15 minutes. Serve with remaining green onions. Recipe Notes: Be careful when grilling the tomatoes. Obviously they are full of juice, which can drip down and cause flares in your grill flames. I like a spicy salsa, but since I serve this to my 1 year old, I usually remove most of the seeds and membranes in the jalapeño. Leave them in if you like things spicy. The poblanos do provide a little heat, so keep that in mind. I know it seems odd that I say 4-6 poblano peppers. First, it depends on how big your peppers are. I usually try to get bigger peppers. Second, it depends on how stuffed you want them. I used 5 large poblanos when I made this batch, and they still had a lot of polenta in them. If you are looking for a shortcut, you could use store-bought salsa. You should try this salsa at some point though. Low-iodine adjustment: Use iodine free chicken broth and omit the cream cheese.